The Kelly collection by Jennifer Taylor Home is the perfect addition to any living space looking to add a bit of a traditional flair. The fabric selected for the collection features Polyester blends and engineered for long life. Our wood frames are made from kiln dried birch wood which provides exceptional support and stability. This unique design is accented with hand tufting along the back and inner arms. The Kelly is an ideal choice for your living room, den, office, or any living space you prefer. This 3-seater sofa brings class and lounging comfort to any room in the home. We offer a unique versatility in design and make use of a variety of trend inspired color palettes and textures. Our products bring new life to the classic American home. The Kelly gives you everything you desire: a traditional flair, exceptional comfort, and quality that can only come from handcraftsmanship. This unique design is accented with hand tufting along the back and inner arms. The Kelly is sure to light up your home. This stunning sofa has a charming appeal with its diamond tufting. Crafted from birch wood, a deciduous hardwood that isn’t easily mottled or discolored over time, this sofa is engineered to last a life time. Comes in a variety of four colors to choose from. Love the comfort,Love the Satin Teal velvet color. This sofa is beautiful. It is heavy and well-constructed (quality button tufting and welting). Much attention is paid to shipping/handling - the base of the sofa was crated and the velvet fabric was protected by several layers of cloth, fiber mesh and plastic wrap. Only the legs need attaching. Arctic Blue is the perfect name for this sofa color and based on the lighting in your home, it may appear steel blue or ocean blue. One thing that I was sure of is that I did not want light blue or teal blue, and fortunately this sofa is neither. My picture shows the sofa with both silver/gray and gold pillows to demonstrate that this color is a neutral blue; it can be cooled down with silver or warmed up with gold accessories. The sofa sits low to the ground as the dimensions indicate. At first I considered swapping the legs out for taller legs, as I am not accustomed to low-slung furniture. However, I am going to live with it like it is and adapt my style. It is a small sofa (will sit three comfortably), perfect for a living room, large master bedroom or study/library. I love it. 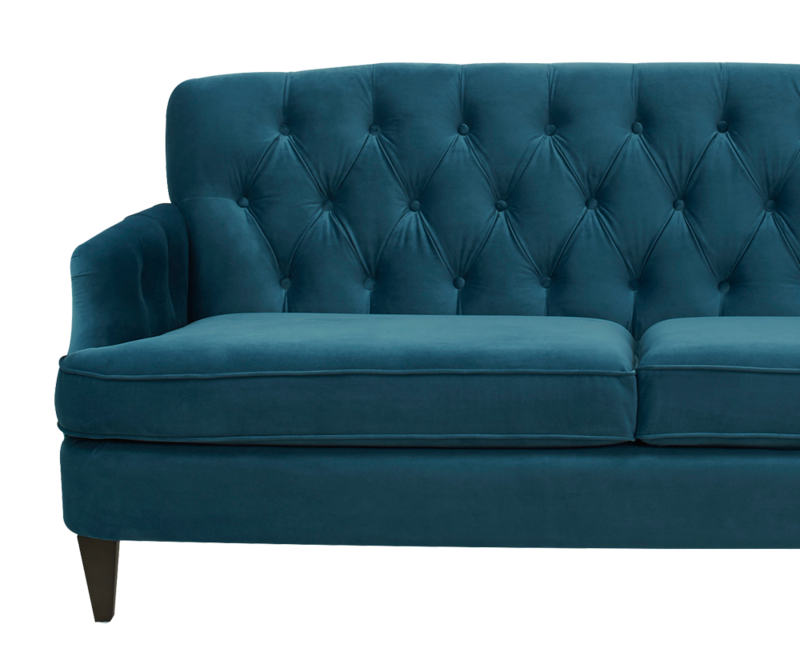 Love the color and softness - my whole family loves the sofa and it’s beautiful!!! Fast delivery a bonus!!! What an absolutely beautiful sofa! It's just the right size for my small apartment living room, and it certainly makes a statement! The fabric is perfect to complete the peacock color theme I’m going for. These sofas are so soft and comfortable! 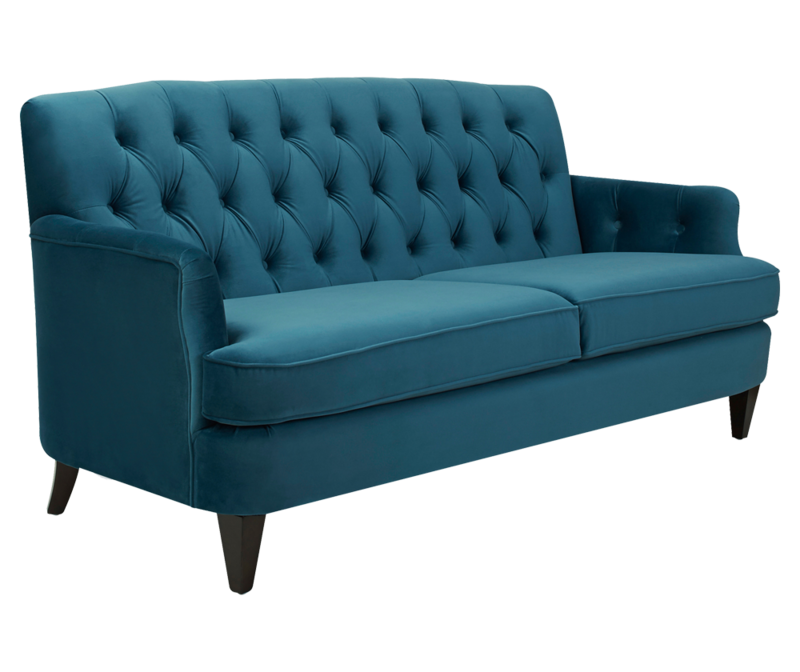 The tufted back and interior of the arms add a classic feel to make it appropriate for many different styles. The couch is beautiful. Teal color is vibrant and as pictured. The cushions are firm and comfortable. Perfect size too. Not too big but not too small. Comes beautifully packaged and well protected. All that has to be done to assemble is to put on legs. No tools needed. Love, love, love my new sofa. Just like the picture. It’s a bit firm , but not using as an everyday sofa. Beautiful color. Super comfortable couch. Great couch for sitting area in bedroom.